The elements Fire and Water compete for supremacy. Afterwards, players insert a pawn from the reserve on the board. By dragging the pawns on the board, you must eject those of your opponent off the board. But be careful, because the Air and the Earth are there to balance the fight and your last action could well turn against you. 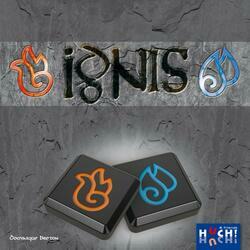 Who will manage to eject all the pieces of his opponent and win the victory: Fire or Water?